1. Sign that I’m getting older: It was a one time incident but Armando will not let me live it down…I called it, “The Twitter”. 2. Sign that I’m getting older: Armando, myself and a group of friends had a party night the other night. We pre-planned to all crash at our friend’s house so we could have a few drinks and not worry about driving home. Instead of drinking games and lineups of shots though, we played board games and had coffee halfway through so we could last until 1am. The “glass-is-half-full” take on it: We actually remember the night, no hangovers and we all had our own bedrooms to crash in, rather than a space on the floor because now we’re adults and we have friends that live in houses and not bachelor pads. Oh, and we can’t forget that nice wine and appies replace the bag of Doritos and promo 6-pack of beer that used to fill our party nights. 3. Sign that I’m getting older: My mom mailed me an article that was cut out of the local newspaper of the city I grew up in. The newspaper has been running a “looking back” column for years. They write about what happened in the city 20 years ago, 30 years ago, 40 years ago, and so on. 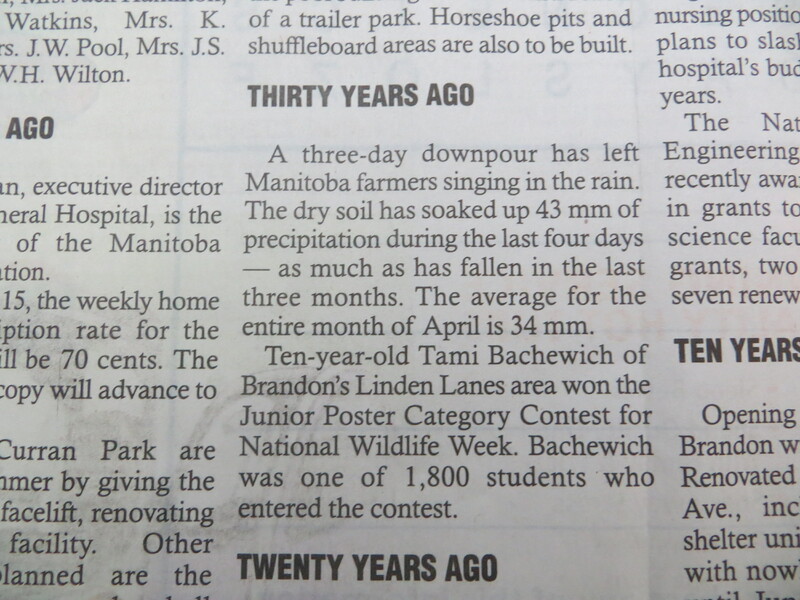 As I looked at the article I gasped as I saw my name under “30 years ago”. Ugh! 4. Sign that I’m getting older: I look at the short, tight dresses that girls wear these days with a bit of a judgemental eye. Which is a little surprising considering I was known for some questionable clothes back-in-the-day. Heck, if I still had the flat tummy, I would probably still be tempted to wear crop tops. The “glass-is-half-full” take on it: I believe my judgemental eye is a little warranted and not because of aging. Case in point: I bought a tank top. Fit me perfectly. But then I noticed the tag inside said that it was a size small. Small?! Could this be true?! My excitement of fitting into a small was short-lived as I soon noticed on the tag that it stated that this tank top was actually a dress. Huh?! *heart sinking to my feet* You mean to tell me that a small dress fits me perfectly as a tank top? Yes, I see this as a sign that clothes are smaller than they used to be and no, it’s not because I’m larger than I used to be. Well anyways, that’s my story and I’m sticking to it. 5. Sign that I’m getting older: I went to The Backstreet Boys concert. The “glass-is-half-full” take on it: I went to The Backstreet Boys concert! !